If you’ve ever been relaxing outside the cafeteria underneath those tables with the big teal umbrellas, youʻve probably noticed HonCCʻs newest mural on the other side of the courtyard. 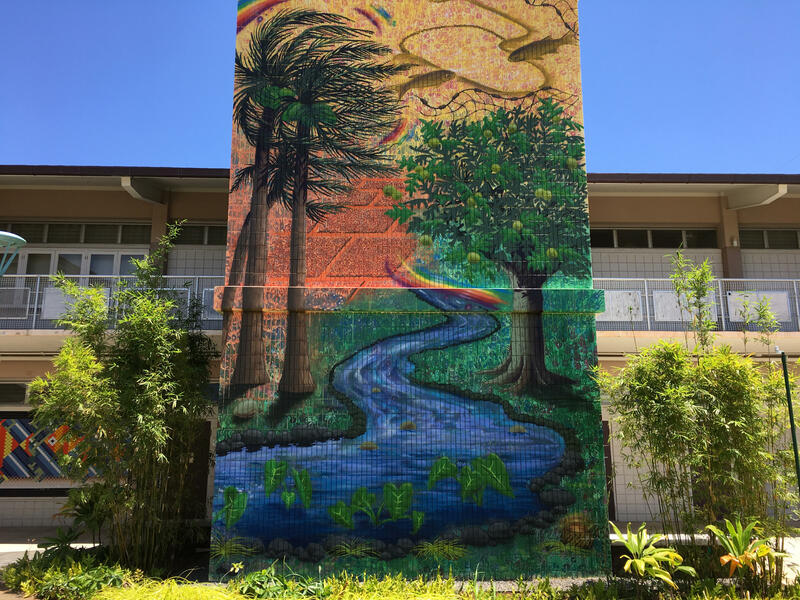 “The inspiration of the mural is the moʻolelo of this land, or in English, sort of like the history or the story surrounding this land that HCC sits on,” said Faith Kahale Saito, a counselor working in the Hui ʻŌiwi Hawaiian Center, who was also in charge of spearheading this project. The new mural was created in collaboration with KVIBE, a program of Kokua Kalihi Valley Comprehensive Family Services, a non-profit organization whoʻs aim is to provide health care services to Kalihi Valley’s low-income, Asian and Pacific Island immigrant population. “There’s this event called the Annual Kalihi Ahupuaʻa Bike Ride where kids ride their bikes from Hoʻoulu ʻAina down to Sand Island. Along the way, they stop in front of three murals and get a chance to the the learn the moʻolelo of that land. With the addition of the new mural, we’re proud to say that HCC will be one of these stops and we’ll get to talk story them and share our moʻolelo,” Kahale said. This year’s ride will be held on June 22. The mural was created by artist MK Davis, a member of 808urban, an artist collective based in Honolulu. Davis enlisted a lot of campus help when he applied the first layers of paint, using something called the manalima method. “The manalima method is when everybody dips their hands in paint and places it against the wall, where the murals supposed to be. It starts off as the foundation of the mural and we do it because it’s like putting your mana or energy into the painting. We had everyone from students, staff, even their kids, come and do it,” Kahele said. Although the mural only took several weeks to complete, there was a lot of behind the scenes effort that went into just the preparation. Some students had a few thoughts they wanted to share regarding the mural. “Finally, they made this place a little better!” Andrew Choi joked.